Given the strength and stability of the U.S. economy, it is not surprising that more foreign investors are selecting real estate business models to secure E-2 visas as a method of obtaining immigration status in the U.S. The U.S. permits real estate companies to utilize the E-2 visa strategy, but companies must carefully structure their models to achieve success. This guide provides foreign investors in the real estate industry the general components of U.S. E-2 immigration law. 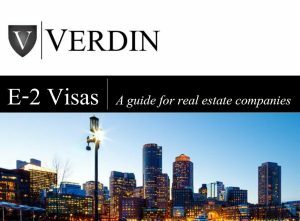 To purchase the VERDIN ebook ‘E2 Visa Solutions for Real Estate’ on Amazon.com, click the button below.